I run Mike’s Fancy Cheese and we make a raw-milk blue cheese called Young Buck, here in Newtownards. We have been making Young Buck for just over three years now. We fitted out a little garage on the outskirts of Newtownards and we work directly with one farmer – Smith McCann – who is about five miles away from us on Hillside Farm in the Craigantlet Hills. I caught the cheese-making bug working in a deli in Belfast. 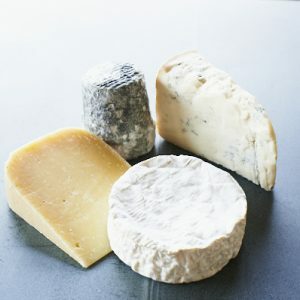 Selling so many different cheeses, and beginning to read up about how they were made and who made them, I realised there seemed to be a dearth of Northern Irish cheeses, so I set out to fill that void. Firstly I learnt my trade at the School of Artisan Food then went to work with David and Jo Clarke at Sparkenhoe Farm for a year, before returning to Northern Ireland to start making cheese. My company is part of the Irish Raw Milk Cheese Presidia, a slow-food group for protected foods, and we work with 10 other Irish raw-milk cheese-makers to support each other and attend events. Most of us only make one type of cheese, so we work together to offer a diverse range! 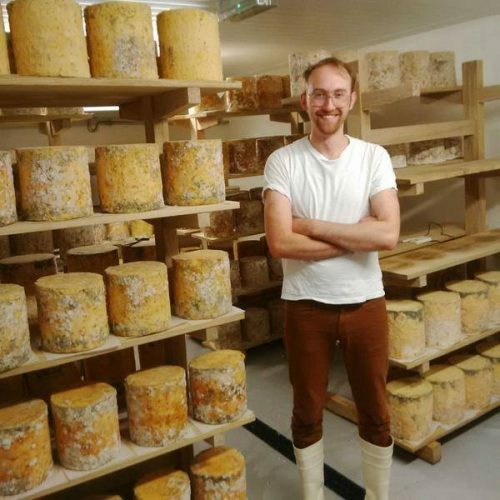 My friend and co-cheese-maker, Jonathan, works for me. He came on board nearly two years ago, when I broke my hand and realised I needed some assistance make Young Buck. He came up to help and then never left! That’s it, just the two of us! Smith McCann’s farm is situated in the Craigantlet hills about five miles from us. He milks 150 Holstein Friesians, bred for ease of care more than anything, with a lot of Swiss-red cross in the herd too, for higher milk quality. I had been working in a deli for a few years and that is where I realised that Northern Ireland wasn’t making any good small scale farmhouse/artisan raw-milk cheese, so I set about learning how to make cheese with the idea that someday I would return to Northern Ireland and make cheese. To make the best cheese possible and have fun running the business. As Young Buck cheese-make is a two-day process I’m pretty busy midweek. We get to the dairy about 6.45 am to wash down and get ready to pick up the milk. One of us picks up the milk whilst the other cuts and turns the previous day’s curd that has been acidifying and draining on the draining table overnight. The milk will be in the vat by about 8.00 am, when we start to heat it and add our bulk culture that has been incubated overnight. We also add the mould at this stage. The second day’s curd is usually ready to be salted by about 10.00 am or so, about the same time as the rennet is being added to the first day’s milk. When we are in perfect harmony, it’s a very smooth day… but it’s the milk that decides and it can get a bit frantic around at times! By 11.30 am the first day’s curd is set and cut, whilst the second day’s curd is now hooped and in the hastener. The cheese=makers lunch begins now! It’s great working with one of your best friends, and we try to make it a long social lunch with time to chat about the cheese and life! Cheese-making is very physical, labour-intensive work, so making sure there is time to enjoy the day is key. Happy cheese-makers make happy cheese. After this there is plenty of store work to do, turning cheese, rubbing up Young Buck, piercing cheese, and so on. I love just being part of the cheese-making community! From my time studying and working on the UK mainland, I was thankful that so many cheese-makers welcomed me on to their farms, let me make cheese with them, and explained not only the actual cheese-making side but also the business side: that is something that I have been trying to instil on this side of the water! One of my favourite memories was probably attending ‘Cheese at Bra’ (a special slow-food event in Italy that takes place every two years) a few years ago. To go there and have people from all over the world being so stoked on eating Young Buck was great. Anything with goat bacon. Our friends Broughgammon Farm keep goats and male dairy calves for goat and veal. They make some amazing goat bacon, and makes a cracking Carbonara. The fact they are cheese fiends makes ‘swap time’ at market a joy! I’d be inclined to go out for breakfast more than anything; a morning off is something to savour and my body won’t let me sleep in. So when you need something to mop up the night before, our local pub, Cassidy’s on the Antrim road does the best ‘frys’ in Belfast. Or if I’m up at the dairy, Haptik in Newtownards do the best brunches; great for when you’re up turning some cheese and working up a hunger at the weekends. My friend David Love Cameron has set up The Walled Garden at Helens Bay. He worked on Raymond Blanc’s and Richard Corrigan’s kitchen gardens and now has set up his own. To have such amazing heritage vegetables on your doorstep is wonderful. The guys at Broughgammon, not only produce amazing meat but they have a few food trucks and make superb goat tacos and veal curries. Our whey goes to our local brewers Farmaggedon, who keep a load of iron-age pigs, as well as brewing some class beer. They’re a co-op of punks with a great DIY attitude, growing hops and in general being great. Our other brewing friends, Boundary Brewery, are making some crazy cask-aged, sour and experimental beers. They have regular tap room tastings and let us come along to do some cheese plates and get tipsy. Corleggy Cheese are our closest cheese-making friends. They are a few hours away, and any excuse I get, I’ll go see them to do a delivery or pick up some cheese. Silke is the best host and will fill you up with cheese and pancakes! I’ve been eating lots of St Tola’s ash log: it’s so good, a raw-milk goat’s cheese from Co. Clare, we bring it in for our markets and it’s so bright and fruity. I have been trying to use more cheese in cooking too recently and I need to bring home twice as much as I need because I’ve eaten half of it before I’ve started cooking! We do a lot of beer-and-cheese nights in Belfast and we work with Boundary Brewery I mentioned before – they do some great sour beers with crazy yeast ferments which go down great with a plate of cheese. Being stocked by The Courtyard Dairy of course! We aren’t one much for entering awards so just seeing it being used by chefs is a great indication we are doing something right. In Belfast we have two Michelin-star restaurants which we supply, and we also do cheese plates for two of Belfast’s oldest pubs – that’s what I always wanted to do: have a cheese that was as accessible to as many people as possible. We run “pay what you want” cheese and beer nights with the idea that anyone should be able to experience great local products. 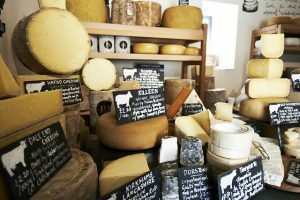 To keep trying to make as good a cheese as possible, and hopefully encourage a few more raw-milk cheese-makers to start up here in Northern Ireland! You can buy Young Buck Blue and also follow Mike and his business on Facebook and Twitter.